As announced in my last post, here are the final minis for my Anglo-Saxons. One more point of Warriors. 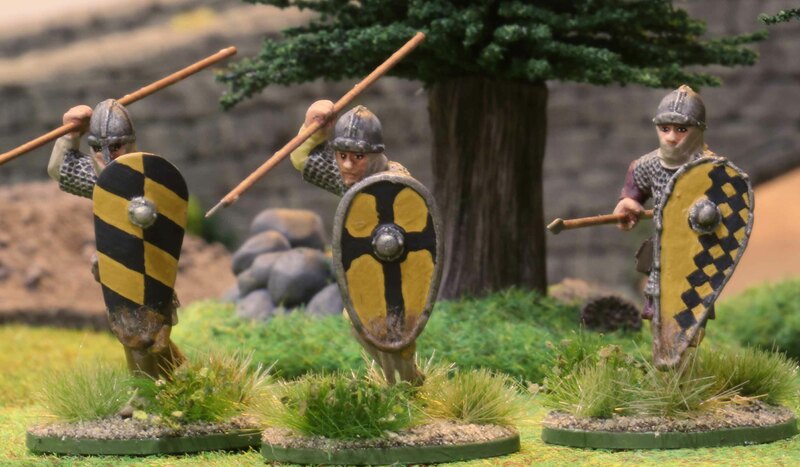 Again Gripping Beast plastics with LBMS shield transfers done the same way as all the Anglo-Saxon Warriors before them… so not much to say about them. But that was not all I did to finish my Anglo-Saxons. As I said, I played them with a Religious Advisor Warlord. 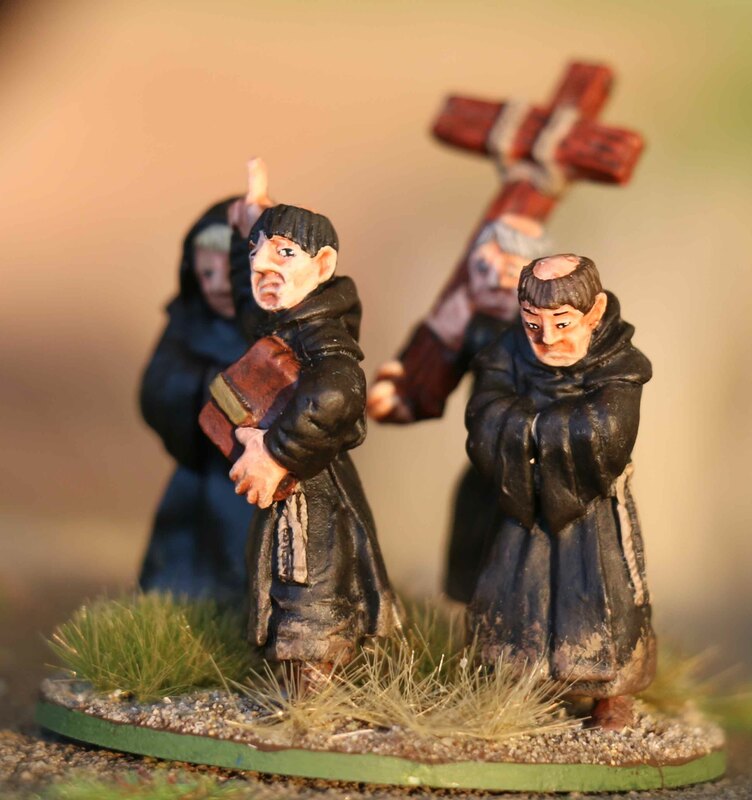 I had wanted to actually use the warlord base I had painted at the very beginning, but in case someone complained, that this was too combative (which no-one did) I needed a base that looked like it was… well religious enough and came across the set with the monks from Gripping Beast. 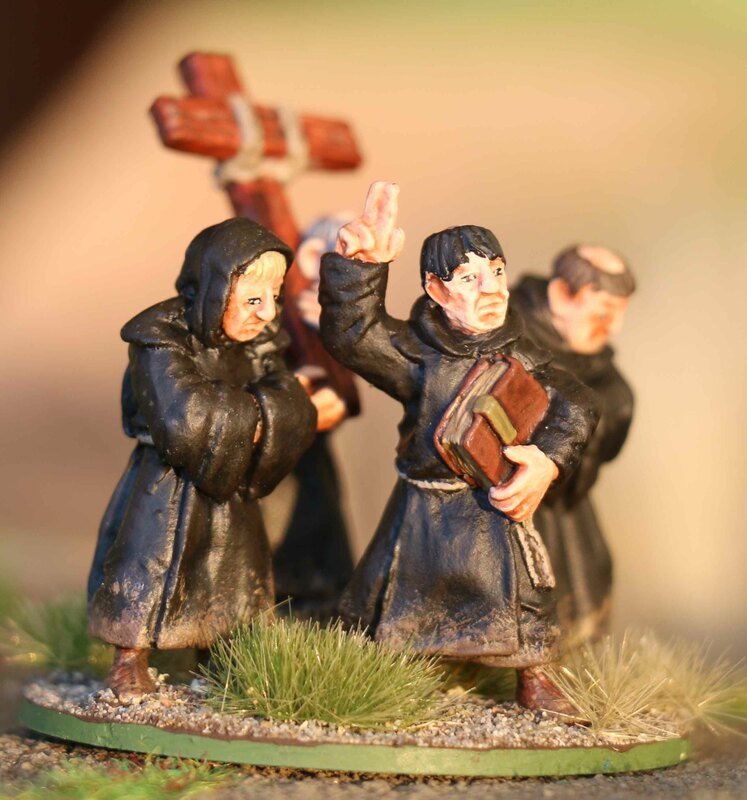 I painted them up as Franciscan friars. Not sure why really, but thinking about medival monks, the first thing that came to my mind was “The name of the rose”, so that seemed fitting. While I based them the same as I do all my Warlords, they could just as well serve as a marker for the “The Baggage” scenario of just act as extras on the battlefield. They were a fast paint job, but I really enjoyed them a lot. Well this was my last post for this years Analogue Hobbies Painting Challenge. I have the next (and last batch) of 8 Anglo-Saxons for SAGA on my workbench right now, but since I spontaneously started a new job the other week on Wednesday (I guess that is what you call it when the project a start in May and then ask you if you could start in three days time), I guess I did not have the time to finish them before the Challenge ended. Actually they are still on the workbench, with the tournament I want to sue them for taking place next Saturday! :-O But alas, my original goal had been 250 points and I have more than doubled that with a grand total of 570, so who cares! Anyway, this is another SAGA point of Thegns for my Anglo-Saxon army. Just like the last ones, these are pretty straight forward Gripping Beast plastics, with LBMS shield decals. The warrior with the blue shield is a slight conversion that I felt was required due to his un-combative pose, but that is it. Only the usual chainmail sculpted where the arms meet the torsos, painted, based and ready for combat. I have to say I like the GB plastics. Good detail for plastics and lots of character in the faces one can work with. So I was glad to have done a lot of them this Challenge. Hope to be showing you the last 8 Warriors and an alternative Warlord before the weekend… keep your finders crossed! So this is it. The Challenge is drawing to an end and I am guessing, this will be my second to last entry (maybe even my last one… not sure how much progress I will make the next couple of days). Again some Anglo-Saxons for SAGA or to be more precise, one (SAGA) point of Thegns. These are pretty straight forward. Just plastic Thegns with spears, virtually straight out of the box. The only thing I had to do was sculpt a little chain mail around the shoulders, where the separate arms meet the torsos. The shields are transfers from LBMS and that is about all there is to say about them. Well not really, as there is an extra minis with a standard. Now in SAGA you have the option to swap one Heathguard or Warrior in a unit for a standard. I could go on forever how clever I am and that I wanted a standard to keep all my options open, but truth be told… I simply lost count while cleaning up these minis and did nine spearmen instead of eight. So I simply added a standard I had printed out for some Rohan cavalry for Lord of the Rings to his spear and that is it. So, now there is two more points of warriors left to do and I am good for the SAGA tournament next month! Having rekindled my interest for SAGA last year with my participation in the Grand Melee I feel it is time to add some more factions to my collections. One of those are the Anglo-Saxons. I always liked the way the looked on the paper and their large units in SAGa make them look appealing on the tabletop as well. At least I hope so, since this is only the first (SAGA) point and the Warlord I have painted. Up first are the Fyrd (Anglo-Saxon Levies). 12 men in all for one point. I usually do not like Levies in SAGA, but I find the Fyrd quite interesting. For one if they are armed with close combat weapons they have the same armour as the Warriors. 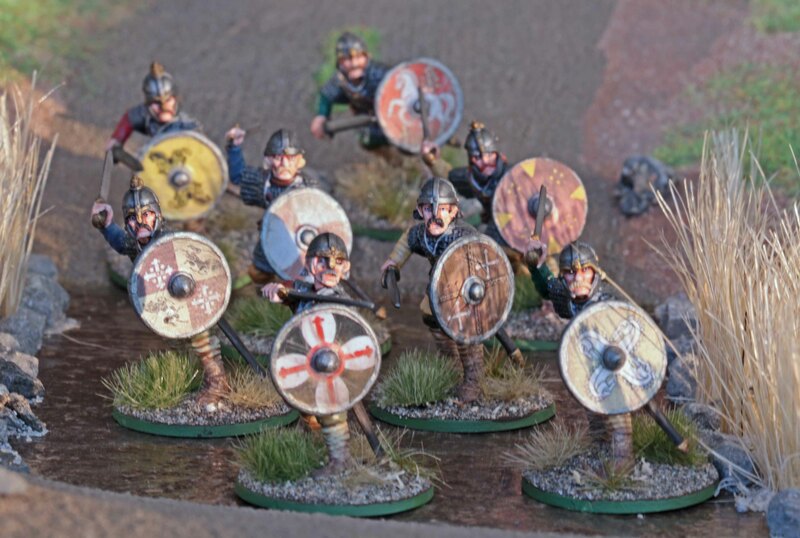 Second, while most factions have problems activating their Levies, the Anglo-Saxons have some abilities that allow them to activate units based on size, making a large unit of Levies all the ore interesting. The minis are all plastic minis from Gripping Beasts Levy box, but I gave them all helmets from the Gripping Beast plastic Saxon set. This means they are not wearing any chain mail of other body armour, denoting their Levy status, but with their shields and helmets, they are better armoured than the average Levy in the game, underlining their better armour values. The shields are transfers from LBMS. Up next is the Warlord. 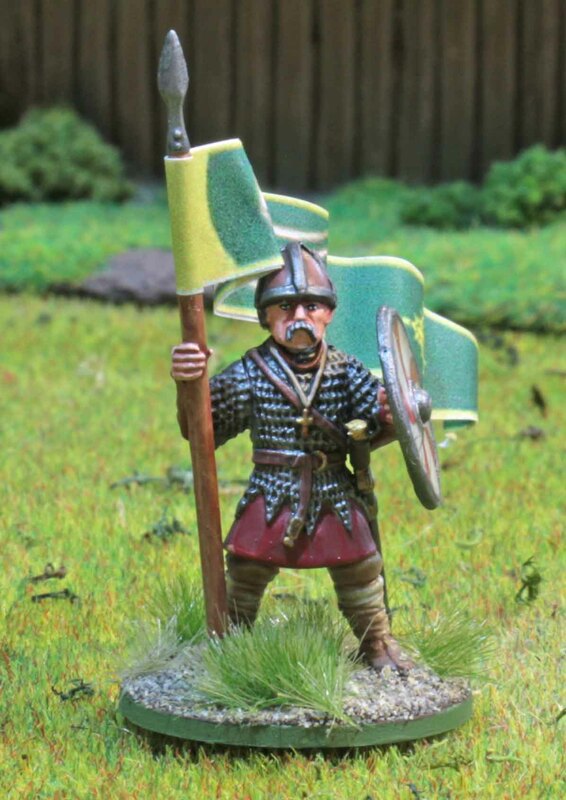 The Warlord model himself is an Anglo-Danish Warlord from Stronghold Terrain, but I felt he would make a great Anglo-Saxon Warlord none the less. After all his clothing and armour are generic enough to let him pass as either. Since SAGA allows / asks for a larger base for the Warlord, one can usually add some scenic elements. In this case I chose two more warriors. Both are from the Gripping Beast plastic Saxons set. Their shields received transfers from LBMS. Same goes for the large banner. The Dragon Banner came with the plastic set. I wanted it to look very colourful. Probably not right for the Anglo-Saxons, but I always liked them colourful. The shield on the Warlords back was hand painted, since I felt that none of the transfers would fit it. The design is a bit simpler than what one would expect from a Warlord, but painting him up, he rather looked like a nitty-gritty kind of person, so not much decoration on his clothing and shield for me. To underline his nitty-gritty looks I made another addition. I can not be seen too well on these photos but his left foot is resting on the severed head of one of his enemies. And I wanted him to look like he had just chopped that one-off. So there is some blood and gore dripping from his axe. (I felt this did not show too well on the other photos so I put a piece of paper between the minis for this photo). After the preparations for the Battle of Berlin game were done, I felt it was time to paint some minis for SAGA. The German Grand Melee has really re-kindled my interest in SAGA, so I am planning to paint up a few new Warbands for it. I already have Normans, Anglo-Saxons, Scots and Spanish to paint, but before I get started on those, it was time for some Swords for Hire. I had bought these Flemish Mercinaries about two years ago. The big problem with these guys was, that their rules could not be found in any of the SAGA books, but only in their packages. So I kind of bought these unseen. So after buying them, I found they did not fit my Vikings too well. So they were just stored away. When I prepared for this years Grand Melee, I felt they would fit my Byzantines. So I cleaned the minis up and primed them. Only then did I realise, that Byzantines are not allowed Swords for Hire. But since they were already cleaned up, they made a natural choice for the first minis to get back into SAGA. 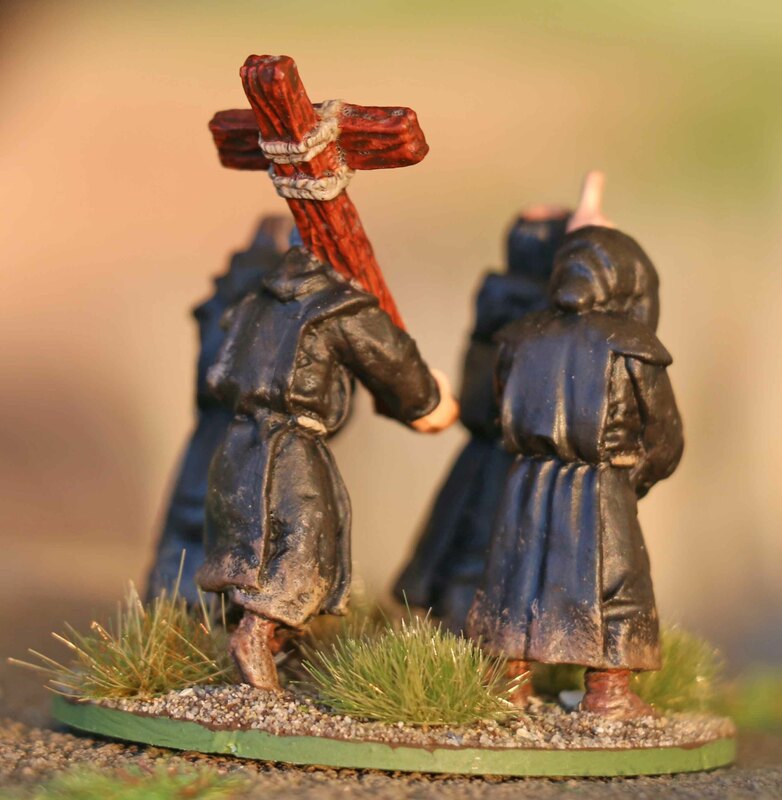 Plus they should fit into some of the other Warbands and will be useful for both Dark Ages and Christian Crescent & Cross Warbands, since the rules for (Flemish) Mercinaries are similar in both. Not much to tell about the paintjob or minis. The bugler was a but of a letdown, with lots of flash on the mini, which required a lot of cutting and sculpting. All the rest was straight forward paintjobs. The shields are all hand painted. I decided to only add some dirt to them, but no battledamage. Never liked the looks of damaged shields too much, so that was it. The colours for the shields were kept in yellows and blacks. Not too sure if those were already the Flemish colours during the dark ages, but I felt it was fitting. Some for the Flemish Lion. I kept that one deliberately simple, to make sure it fits in with medival theme of SAGA. After a long hiatus brought on by both the holiday season and work, Martin (with a little help from his son Max) and I were finally able to get another game of SAGA under our belts. We went for a table with open terrain and just a few fields, trees and hills. The most restrictive terrain was a creek cutting off one corner of the table and a Viking village in the other. But to be honest, the terrain played just a small role, except for the fact, that I used the creek to hinge my flank on. Martin and Max played Normans in what has now become Martin’s signature set-up. 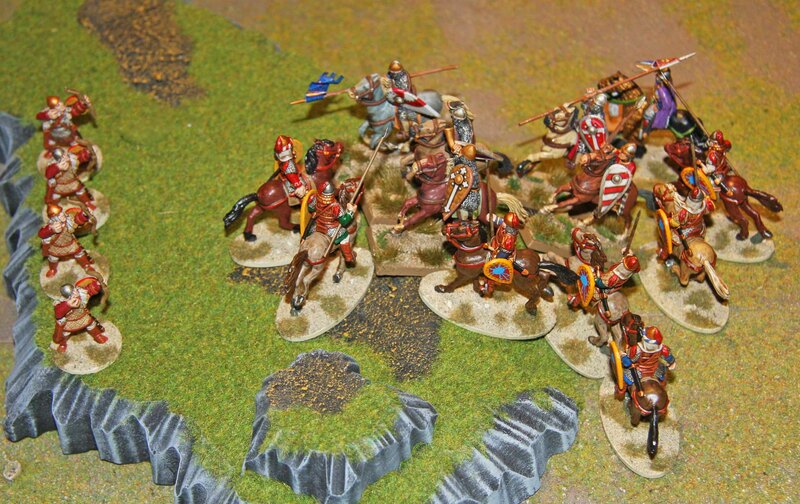 A mounted Warlord, four units of mounted Knights (Hearthguard) and two units of Sergeants (Warriors), one of them armed with crossbows. Martin would amalgamate two of his Knight units into a large one. I wanted to try something new. While the Byzantines are nice, I still feel they lack a certain panache some of the other groups have. So I went for a Varangian Guard Warband (Viking mercenaries in Byzantine service). They were led (as required) by Harald Hardrada. There were two points of Varangians (Viking Heathguards) armed with Dane Axes, one point of Kontaratoi (Warriors with spears) and two points of Toxotai (Warriors armed with bows). As the interested reader will notice, this only adds up to five points, but with the Warlord being a hero of the Viking age, he costs an extra point and therefore only allows for five points of units. I have to say I would have liked a different composition to get away from that huge block of archers, but all Heathguards have to be Varangian and the need to make up less than half the units. 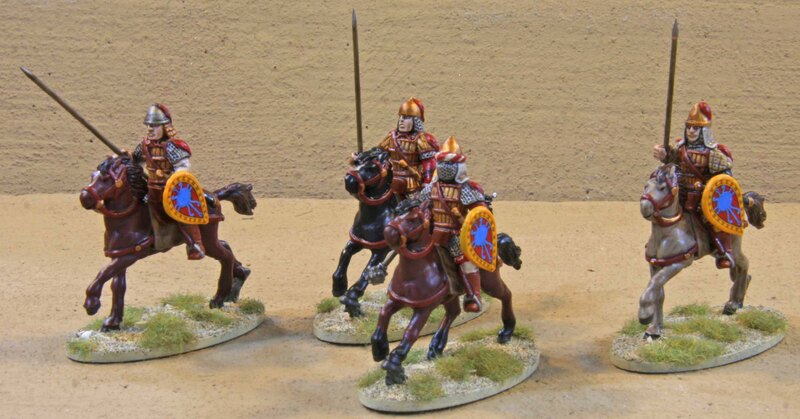 Byzantine cavalry was not allowed as well, which limited the choices somewhat. 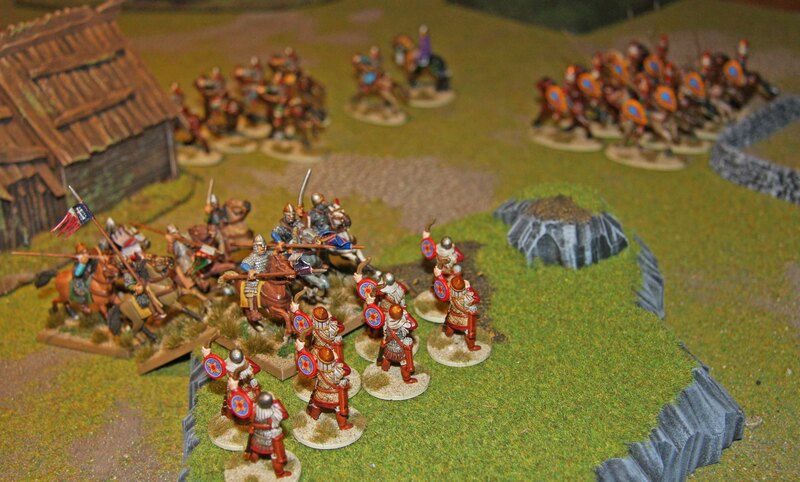 I was also a bit anxious, since a Varangian Warband is played with both a Viking and a Byzantine Battleboard. The Byzantine units only generate Continental (also called Norman dice), while the Varangians can choose to generate either continental or runic (also called Viking dice). The Warlord can only generate one die per round unless he takes fatigue to create on or two extra dice. We decided to play Clash of the Warlords, as we do most of the time. I think we really need to take a look at the homegrown scenarios on the Gripping Beast forum! We rolled for initiative and rolled a tie. So in other words… I won an account of my more impressive facial hair. The Normans deployed the large cavalry unit in the centre and one each of the small ones on each flank. 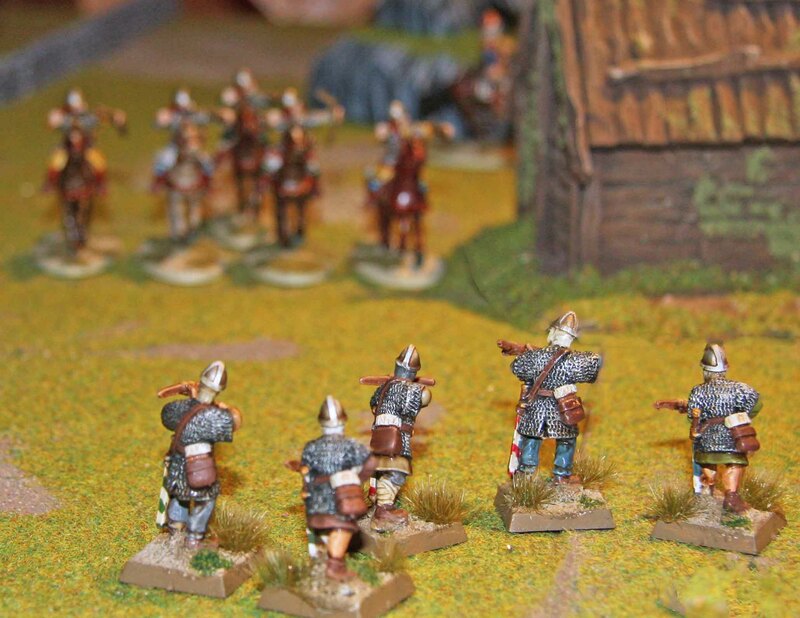 The crossbows were deployed on their left flank and close combat Sergeants on the right. The Warlord was slightly off centre to the right. So in other words… The deployment I have come to know. 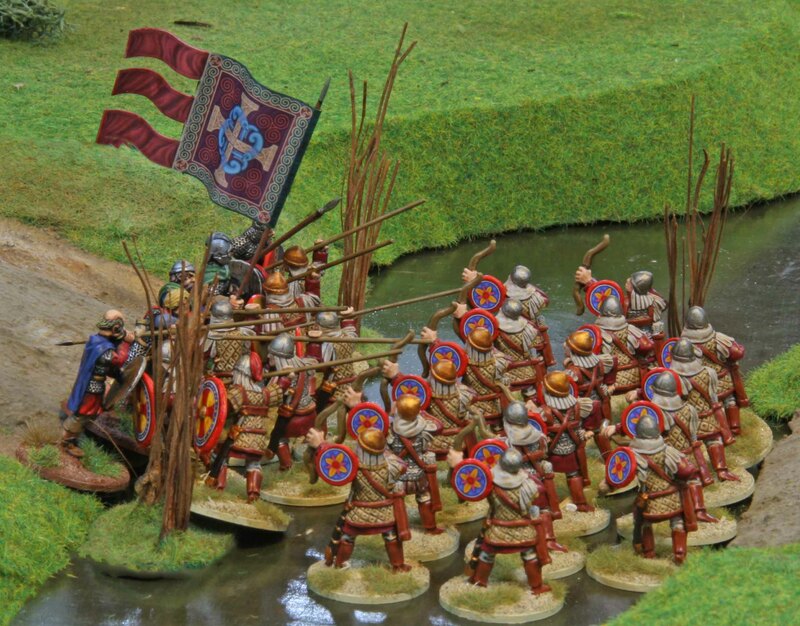 The Varangians deployed their Byzantine archers in one large amalgamated unit right behind a spearmen screen. As indicated their right flank hinged on the creek. The Varangians deployed one behind the other on the left flank and the Warlord behind the spot where the Byzantine and Norse units connected. The Normans won initiative and started a general advance. Max had been able to roll enough flags on the dice to allow for two re-rolls, so it did not stay there. The large unit of cavalry activated for a second time and charged the Kontaratoi. Aided by some Norman abilities they got a lot of dice and one instant kill, but on account of some good saving throws on my side only killed four of the spearmen, who in turn killed two Norman horsemen before being forced to withdraw. With initiative passing on to the Varangian Guard, it was time to decide how to spend my SAGA dice. I went for two continental and four runic dice (my warlord had to take one fatigue for that). Now the runic dice went really well. Even after two re-rolls I still had two suwulo dice. So the first thing was for the Varangians to call Ragnarök, which meant one less armour for all Normans for the rest of the turn. 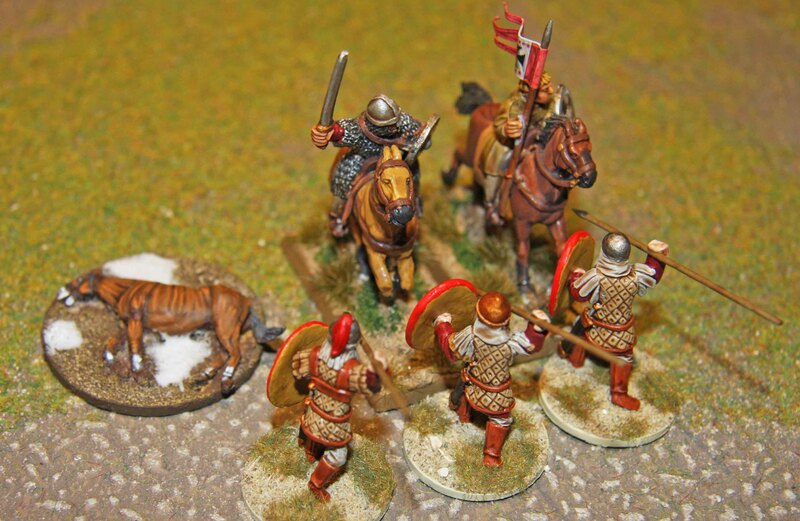 While the Kontaratoi only removed the fatigue left from their last combat, their Toxotai brothers shot their bows at the large Norman cavalry at pint blank range… another two horsemen dead. 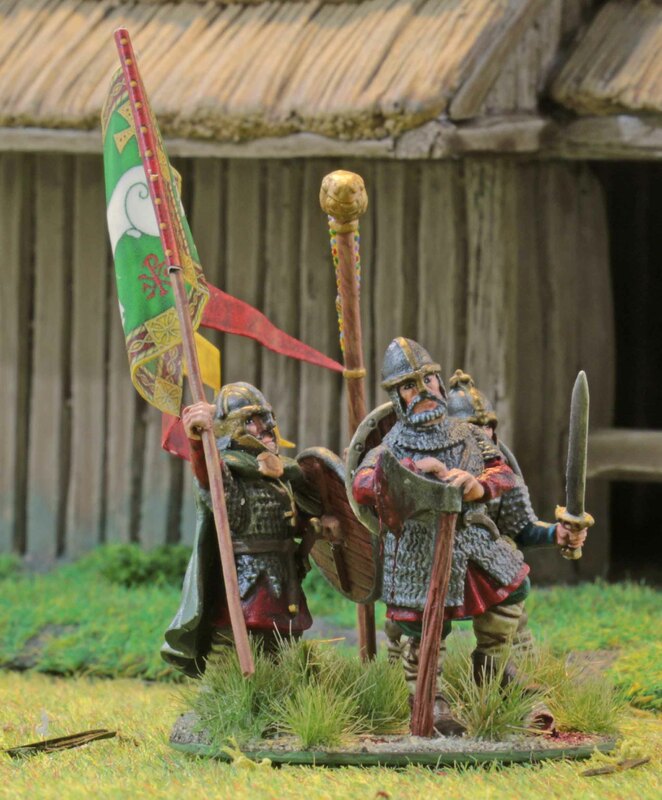 Now the lead unit of Varangians charged the Normans. Bet ween their Dane axes, the Norman fatigue and the Ullr ability (which allowed them to re-roll failed to hit rolls) they scored nine hits. Max failed to safe enough and the four remaining horsemen were on the way to their graves. 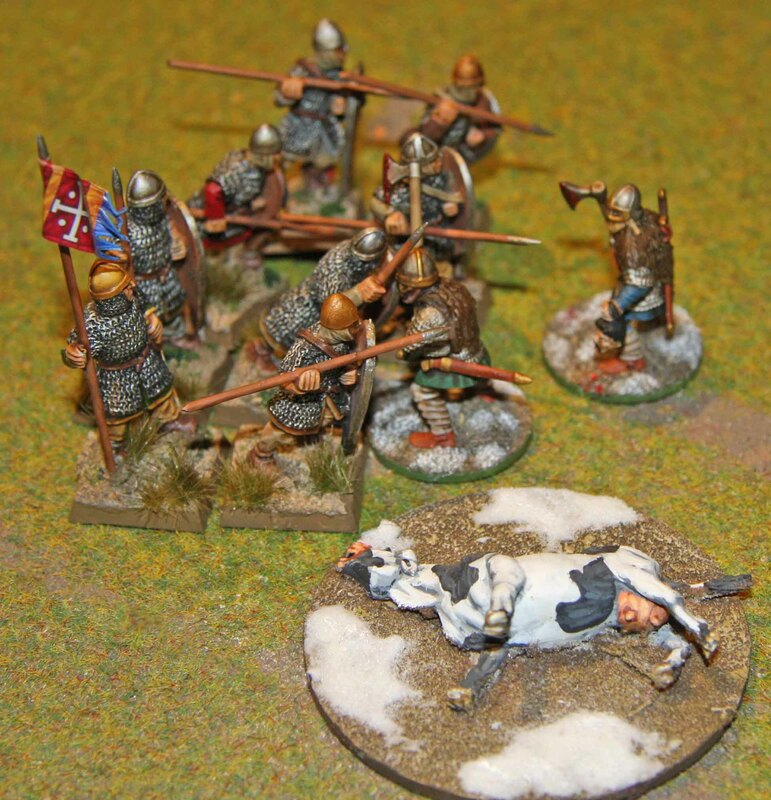 The Norsemen mercenaries lost two of their own, but in the end, it was a small price to pay, for taking out the largest Norman unit before the first round was over. It was a huge psychological blow for the Normans. For the next round they only advanced cautiously, with their foot troops catching up to the horsemen, while the later only loitered around, just outside arrow range of the Byzantines. The Vikings too used this round to get their formation back in order. Varangians formed a new screen before the archers (the blooded unit to the right, the fresh one to the left) and the archers moved forward behind the mercenary screen. The Kontaratoi moved to the left taking over flank protection. The next Norman activation saw another advance, mainly by the foot troops, but also by the cavalry on their right flank. The crossbows activated another time and fired a volley at the depleted Viking unit. But on account of their superior armour that unit only took one loss, bringing them down to one man. With activation now passing back to the Varangians the Byzantine archers opened up on the Norman crossbows and showed them how to do it… three crossbows down. 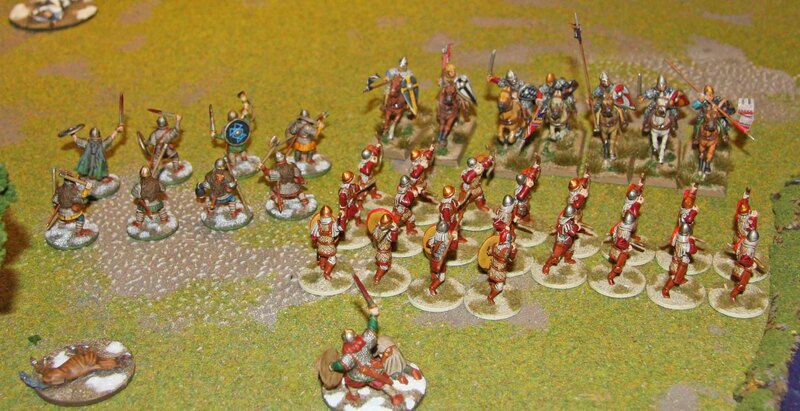 Otherwise the Viking unit which was still in mint condition moved forward towards the cavalry that had inched forward more and activated for a second time to charge them. Since their Warlord had taken another fatigue to roll and extra die and since I had been lucky with the re-rolls they too could make use of Ullr and annihilated all four horsemen at a loss of two of their own. Obviously things were not looking too good for the Normans by now. When their crossbows activated to fire at the archers, the gods intervened and made them move instead (did I mention that I had gotten really lucky when I last rolled the SAGA dice?) 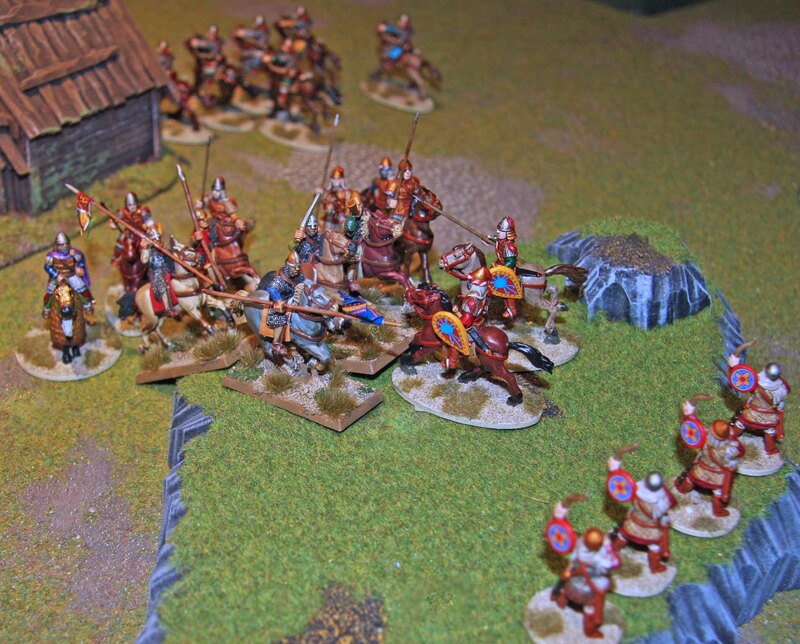 the Sergeants charged the Varangians who had just killed their mounted Knights. Now this actually went well for the Normans since they wiped out their opponents (although I can not remember what price they paid, but I think it was only one or two). But this is where the luck ended for the Normans. For the next activation I decided to put an emphasis on continental dice and the Byzantine archers were able to get two massed volleys. The first one was fired at the Norman crossbows and managed to kill all five of them. I think in about a dozen games played versus the Normans, this must have been the first time, I killed the whole unit of crossbows. So for a lack of targets, they shifted their aim to the Sergeants on the other flank and killed another two. 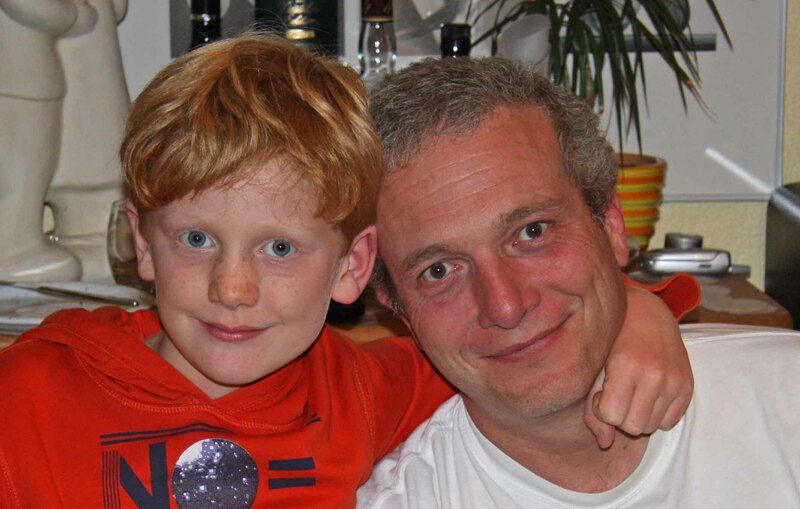 Not much else to do…. Now it was time for one last Hail Marry attack by the Normans. With a double move the Norman Warlord charged the Toxotai and ordered the remaining mounted Knights along. Beefed up by some Norman ability, they hit the enemy archers and inflicted a total of six losses for only one loss of their own. Not content with their success, the Knights charged the retreating Byzantines once more, without their Warlord this time. But now it did not go this well. 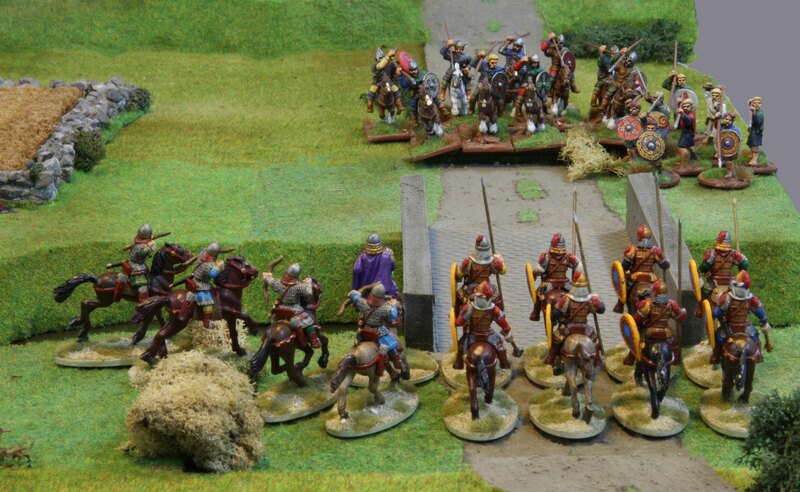 The Toxotai decided to use the three fatigue the Knights had accumulated at the moment they made contact to lower the Norman armour and this time none survived, while the horsemen failed to make a real impact. And this set the stage for the final assault of the game. The Varangian Warlord charged his counterpart with a double move and ordered the archers (being the biggest unit in range) to join in. Between the two of them, they scored nine hits (the Norman Warlord still had two fatigue, so his armour was lowered considerably) of which he only saved two and perished. In turn he only scored three hits of which the Norse Warlord saved two. 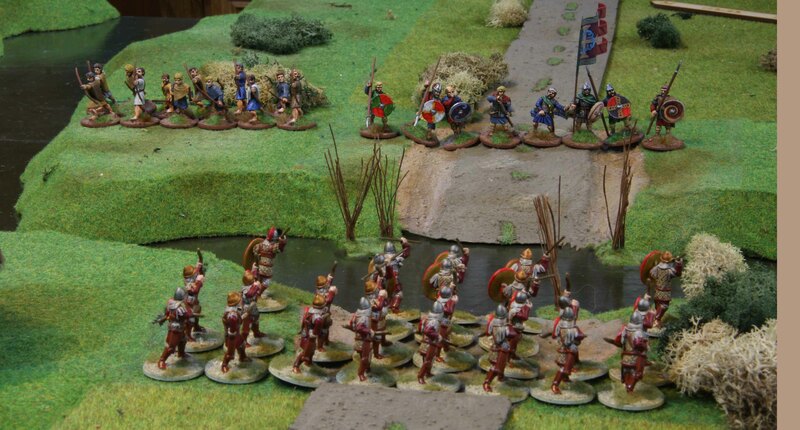 So some thoughts on playing a Varangian Guard Warband. My decision to try them out had mainly been driven by the fact that the Byzantine Warbands seem to be very defensive. The best you can get from their Battleboard (unless you field an all cavalry force for which Normans would be better suited though) is by fielding a large amalgamated unit of archers or two units working in unison. With the close combat screen they require they become very cumbersome and usually stay in place. Either waiting for the enemy to come to them or for the other units to operate under their screen. As I said very static and defensive. Before I leave you, just some other news. I managed to finish the next generic unit of French Napoleonic infantry the other weekend, but never got around to finish their bases. But at the same time, I made good progress on the next French unit. They should be finished today, so I shall do the bases for both in one go and show them to you this weekend. After having played far too few games this year we met for a game of SAGA last week. After the resounding defeat my Byzantines suffered against Martin’s Normans a few weeks ago, I was really anxious to cleanse their reputation. But before we start… sorry for the poor photos! I forgot to take a tri-pod along, so I had to sue flash photography. In this sense we decided to have another Clash of the Warlords, my Byzantines vs. Martins Normans. This is about the only thing that pains me a bit about SAGA… you always end up playing the same scenarios, since there are so few. We used a simple set-up… Lots of open ground, a few hills, trees, hedges, some houses and a small fortified village. The gates of the village were closed and I suppose the inhabitants watched the feast for the crows unfolding before their homes! The Byzantines consisted of four points of Kavallaroi (mounted Heathguards), two with spears and two with bows, which would be amalgamated into one large unit each. There were also one point of Kontaratoi (Warriors with spears) and one point of Toxotai (Warriors armed with bows). As mandatory, they were led by their mounted Warlord. While I felt that more foot troops would stand the better chance vs. Normans I still wanted to try something new. After all a composition with more foot had lost against the Normans the last time and I assumed, that there was a reason for that. Martin was playing his Normans in virtually the same set-up as last time. 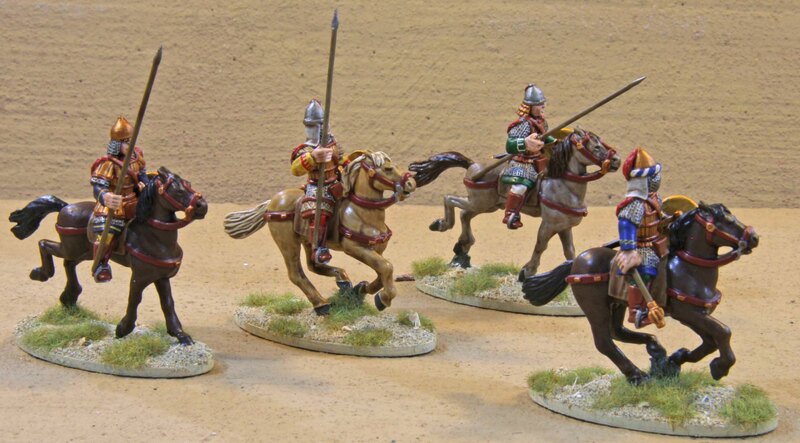 A mounted Warlord, four units of mounted Knights (Hearthguard) and two units of Sergeants (Warriors), one of them armed with crossbows. The only difference this time was that Martin amalgamated his Knights units into two large ones instead of one large and two normal ones. I won set-up initiative and after set-up was completed my forces looked like this (left to right): Kontaratoi with the Toxotai to their right up a hill. Next came my Warlord amidst the Kavallaroi archers with the close combat Kavallaroi to their right. Since I could set up all the interesting units after their opposites, I chose to ignore the left flank, so everything was shifted slightly to the right. 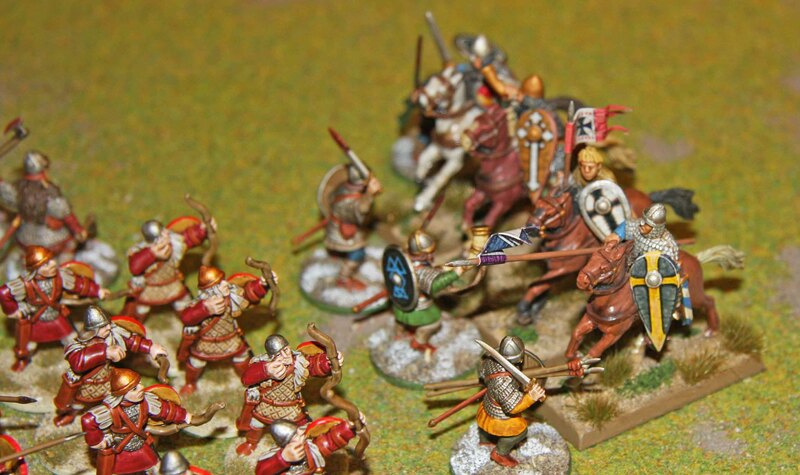 The Normans would deploy their Sergeants with spears to the left (seen from the Byzantines side of the table). since they were deployed early, this took them a good deal to the flank, away from the mass of my troops. the two large cavalry units were deployed in the centre, with the Warlord behind them. The crossbows were deployed on the right flank. The Normans won the first initiative and began a general advance. Not wanting to be caught under my archers fire without a change to do some damage beforehand, the leading unit of Knights activated a second time and charged the Kontaratoi to their front, just barely reaching them. I decided to use the fatigue they had earned for their double move to lower their armour, but still only three Knights were lost, while five spearmen perished under their hooves and had to withdraw. But once it was the Byzantines turn they took a heavy beating. The Toxotai activated twice taking out three Knights on aggregate. Now the Kontaratoi charged the Knights causing them one more casualty, sending them fleeing. On the other flank there was a general advance of the Byzantine cavalry. The horse archers activated a second time as well and shot at the Norman crossbows to their front taking out three of them. With this initiative passed back to the Normans. 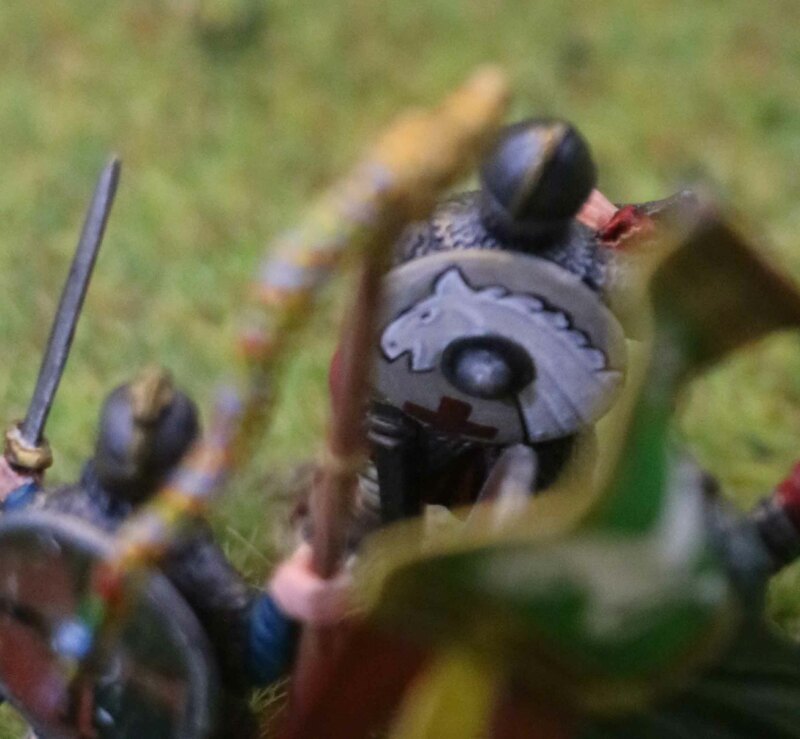 While the spear armed Sergeants tried their best to get closer to the action, the Knights that had already clashed with the Byzantine spearmen charged them one more time. Neither side took a loss, so they had to withdraw. On the other flank the crossbows shot at the horse archers to their front, but even with crossbows against cavalry archers (which meant a minus three on my armour) they only managed to take out two with two attacks… The loss of their number already showed. The big action was in the centre though. 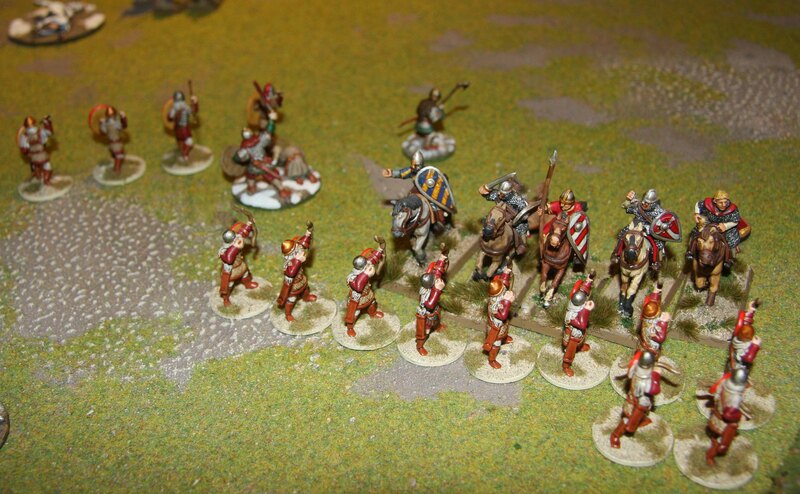 The un-bloodied unit of Knights charged up the hill and engaged my foot archers. Luckily only a part of the unit managed to engage, but still it left four Toxotai dead at the loss of one rider. The archers recoiled and were eagerly waiting for help. And that help was about to come. These Knights were still within line of sight for the Kavallaroi archers, which let loose with their arrows… two Knights down. But they were also in range for the Byzantine Warlord and the other Kavallaroi unit and combined with the “Kontos” special ability from the Battleboard charged the Knights. While two Byzantine horsemen died, the Knights were annihilated. The Norman Warlord would have been in distance for a charge, but only two or three Kavallaroi would have been able to get into fighting distance, so I chose to rather take my time and leave the two remaining dice on the Heathguards field of the Battleboard untouched. 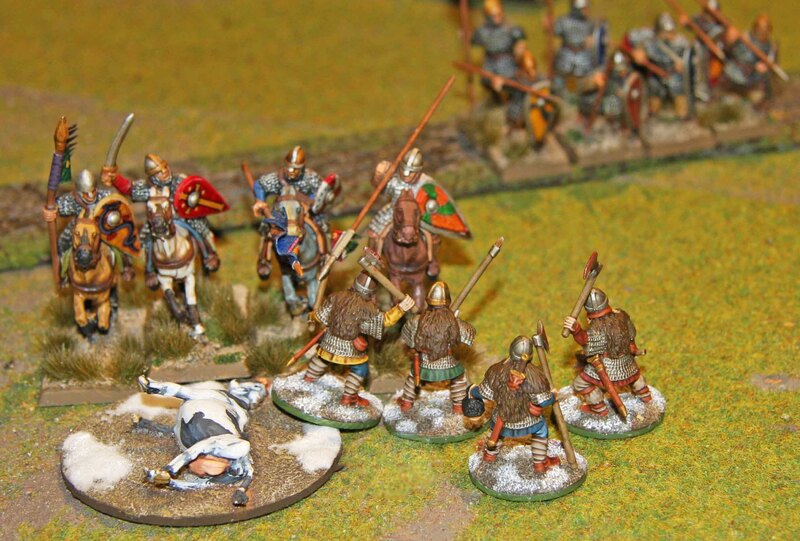 But the Kontaratoi took another charge at the Knights and caused one casualty at no loss. With initiative passing back to the Normans, the remaining two knights decided to take revenge and actually managed to kill those pesky Byzantine spearmen now. The crossbows let go with another flight of bolts, but only killed one Kavallaroi archer (the Sergeants fatigue was used to raise their armour rating). While the Sergeants with spears advanced boldly, the Norman Warlord decided that retreat was the better part of valour and out some distance between himself and the battle. Now things were winding up. The Kavallaroi archers fired back at the crossbows causing them more harm (can not remember how many though) while their close combat brethren, together with the Warlord, charged the remaining two knights, killing them without a loss. My foot archers only rested to recover from the fatigue of the previous battle. Even on their own activation the Normans could not do much. The crossbows fired once more, but failed to do any damage. The close combat Sergeants chose to charge the Byzantine Warlord twice, but while he only laughed at their attacks, he managed to kill six of them. So with only a few Sergeants remaining in two units and the Norman Warlord on the horizon already riding towards the setting sun, the few Normans that remained, decided to surrender. A wise decision! All in all I feel that the Byzantines honour has been cleansed. I am still having great fun playing them, but I am getting ever more disappointed by their Battleboard. There are some good abilities there, but they always seem to be geared towards extreme Warband compositions (either lots of levies, lots of archers or lots of Warriors) do to the fact that you always need to have units cooperating with one another to make use of them. Since you can hardly ever combine all these extremes in one Warband, especially one that lives off its Heathguard horsemen, this means that many of the abilities are denied to you based on what composition of troops you choose. A bit sad, but it can not be helped. Still they work, but I think they are at a disadvantage against those Warbands that have strong Battleboards that work on single units instead of the cooperation approach. 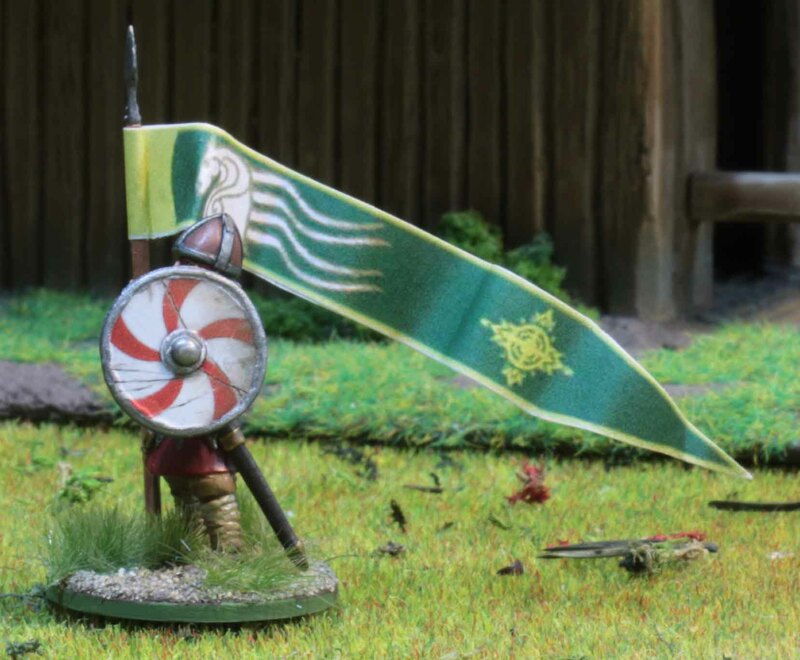 I guess I will have to give the Varangian Guard type of Warband (which combines a Byzantine board with a Viking one) a try soon. That should be interesting! Last weekend saw my Byzantines vs. Martins Welsh. Martin played Welsh, led by a mounted Warlord. There were two points of mounted Teulu (Hearthguard) and two points of foot Teulu, one point of Priodaur (Warriors) and one point of bow armed Bonnedig (Levies). The Teulu would be amalgamated into a large foot and large mounted unit respectively, giving Martin only five SAGA dice to roll. I chose to give my Byzantines their first outing. They too were led by a mounted Warlord. There were three points of Kavallaroi (mounted Heathguards), two with spears which would be amalgamated into one large unit and one with bows. To bring the numbers up there was one point of Kontaratoi (Warriors armed for close combat) and two points of Toxotai (Warriors armed with bows). This would give seven SAGA dice rounded down to the maximum six to roll each round. 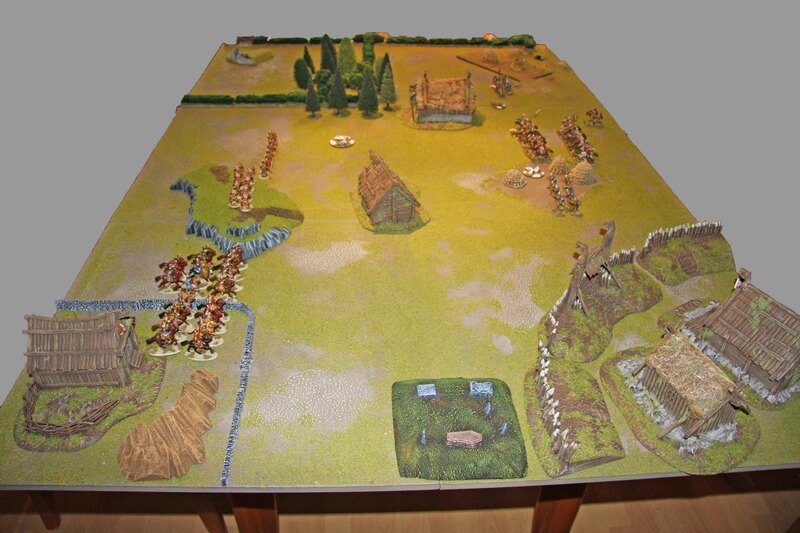 The table was set up for a “Battle at the Ford” game. Open terrain with some hills along the table edges, a few fields and small hills and a small village (which would play no role at all). The main feature obviously was the river running through the middle of the table. Seen from the Byzantine side there was a ford slightly to the left of the middle of the table and a stone bridge to the far right. We rolled for initiative, which was won by the Byzantines. So I set up my Warriors to the left opposite the Ford, with the Kantaratoi up front. Now Martin had to set up all his troops. So he placed his Bonnedig and foot Teulu in front of the Ford as well. His mounted Teulu, Priodauer and Warlord were set up on the other flank, in front of the bridge. As was to be expected, I set up my cavalry and Warlord to oppose any moves made by them. The first round was quiet uneventful. I had won the initiative and even though both sides advanced at full speed, we ended up without bowshot. For the second round it was clear, that my archers on the left would still be out of range, so I just advanced them further. On the right the lines would be close enough, or at least I thought so. 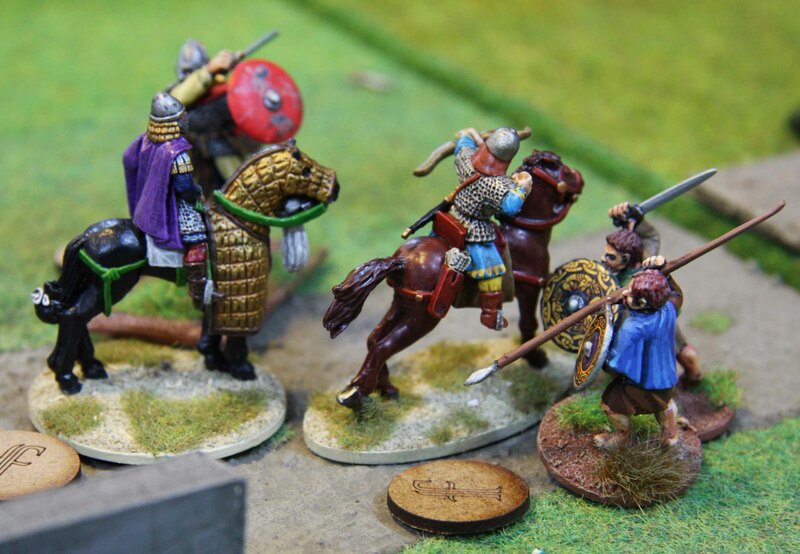 A quick measure showed that the Byzantine cavalry were just a few millimetres short of making contact with the Welsh cavalry and therefore decided to charge the foot warriors together with the Warlord. Technically they should have had a chance to kill them all, but in the end two survived, at the loss of a single Byzantine horseman. Not too bad a result. Well now it was the Welsh turn and as came to be expected their eight mounted Teulu and the Warlord charged the Byzantine riders. The mounted archers fired of a volley in support, but failed to make an impression. Since the Welsh spend two extra SAGA dice to gain extra attacks, I decided to sacrifice half my attacks to gain more defensive dice, but in the end there were enough unsaved hits to kill the Kavallaroi almost twice and they perished. This was not looking good! But at least they had taken three Teulu with them. On the other flank the Welsh just advanced as well. So at the beginning of the third round it was time to take some desperate measures. As a result the Kontaratoi on the left flank got not SAGA dice at all and the Toxotai just two dice to make use of their support archer ability. 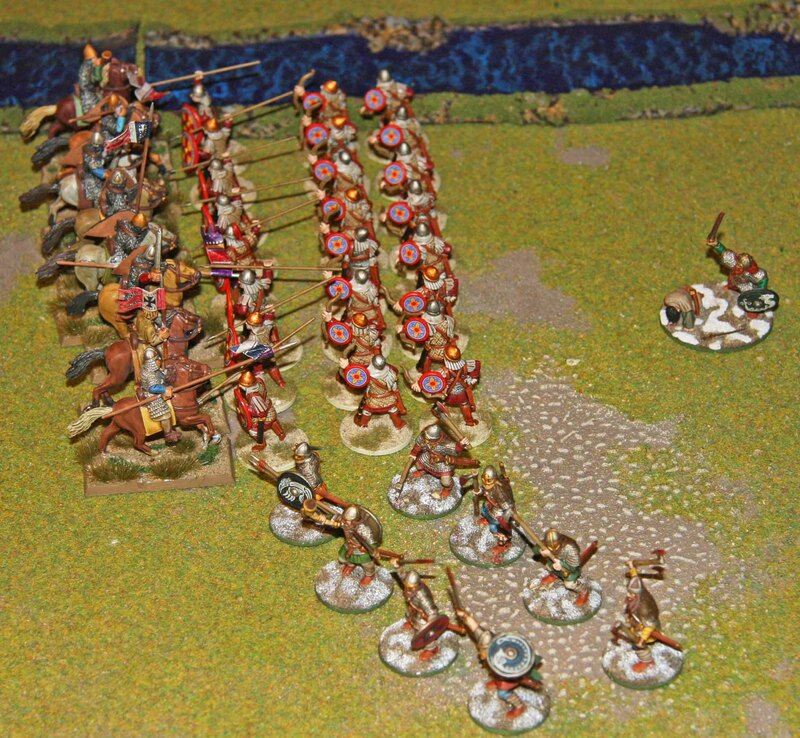 While it is not great advantage over activating both units to fire the regular way (you still spend two dice) it allows them to fire through friendly units, which they did, firing through the spearmen to their front to attack the foot Teulu. And sixteen Warrior archers is not too shabby. They scored five hits and the Welsh only managed to save two… So it was three Teulu down. Not a bad start for this round. A quick calculation on the other flank showed, that the Kavallaroi archers would not be able to kill the remaining five mounted Teulu with their bows alone. So led by their Warlord, they unsheathed their swords and charged in. Together they managed to kill all Welsh riders, but when the dust settled only the Warlord and one Archer remained, but at least some releave for that flank. Now initiative passed over to the Welsh. And they were now starting to feel the loss of the Teulu, only being able to roll 4 SAGA dice now. At the Bridge the two remaining Warriors charged the lone Kavallaroi, killing him at no loss of their own. Now the Welsh Warlord decided to charge his Byzantine opposite. But both went into combat with fatigue and decided to use the other ones fatigue to beef up their own armour. In the end neither scored enough hits to kill the other. At the ford, the Teulu advanced and the Levies, now in range, fired a volley at the Kontaratoi, killing one. Now that initiative passed back to the Byzantines. At the ford the Toxotoi used their Massed Archery on the Welsh Heathguards once more causing them a few casualties (unfortunately I do not remember how many) and the Kontaratoi advanced. That was the best I could do, being down to five SAGA dice now and requiring most for for the other flank, where the Byzantine Warlord charged the remaining two Priodauer. In spite his best hopes, he only managed to kill one and decided to withdraw out of range of the Welsh Warlord with his remaining actions. Now the Welsh Warlord decided to take another stab at the Byzantine one, removed his own fatigue and charged. Due to the distance this took two actions and he arrived with fatigue once more. Again both Warlords chose to use the others fatigue to raise their armour, and again it came to nothing. At the ford the Teulu charged the Byzantine spears, killing three for minimal losses and pushing them back. For lack of dice, the Bonnedig did nothing. At the beginning of the fifth round the Byzantines got two re-rolls on their SAGA dice giving them a massive eight dice to draw from. The Toxotoi got the Support Archer ability twice, to take the Teulu out for good, but the first volley already killed the remaining three Heathguards. So the second volley was shifted to the Levy archers killing five. the Kontaratoi, who had been in position to charge the Teulu advanced on the Welsh archers, but were too far away to charge. 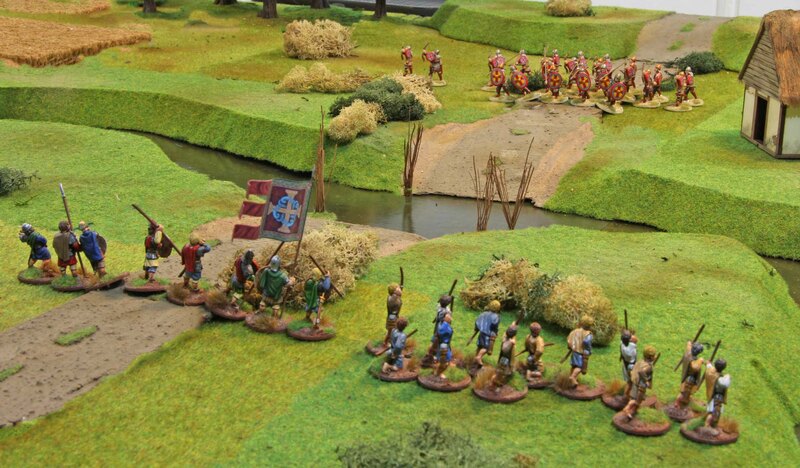 At the bridge the Warlord removed his fatigue and charged the Welsh Warlord. Now only the Byzantine leader could raise his own armour and scored three unsafed hits, standing victorious over his dead opponent when the dust settled. This meant that the Welsh were down to one SAGA die. Since the lone Priodauer could never hope to harm the Warlord, this one went to the Bonnedig archers, who failed to make an impression on their target. All that was left to do now was mopping up. The Byzantine Warlord killed the lone Welsh warrior and another volley of arrows from the Byzantine archers killed another four Welsh archers. The remaining three (with no SAGA dice to roll) saw the futility of further actions and bowed to the might of the Byzantine Empire. As you might remember, I asked you a few weeks ago, what I should do over the festive season and your choice was Byzantines for SAGA. I was happy to oblige and while I had initially planned to post them by units, this did not work out. Due to the cold weather here in Germany I did not want to spray varnish them, which is the step before doing the basing for me. As a result… no posts by units. But after the whole Warband was finished I lost patience and varnished them in-doors. So as a result they all get presented in one go. The lowest units are two units of Toxotai or foot archers and one unit of Kontaratoi or foot spearmen (Warriors under the SAGA rules). These are the rank and file soldiers raised and maintained by the Byzantine state. As such I wanted to give them a uniform look, so they all got tan trousers and dark red shirts. This is also meant to show their origins as a successor to the Roman Empire. As such they received the colours historians (tan) and Hollywood (red) associate with the Romans. This is also in line with my Early Imperial Romans. I guess I will eventually have to get myself another unit of spearmen to give me the flexibility I want for my Byzantines, but for now it shall do. Actually they will have to do for a long time, since I do not have any more spearmen and there is still my resolution not to buy any minis this year (which I have not breached so far). That is unless there is anyone here who has a unit of Byzantine spearmen he does not need and wants to trade them for archers (for some reason I bought one unit more than I needed). 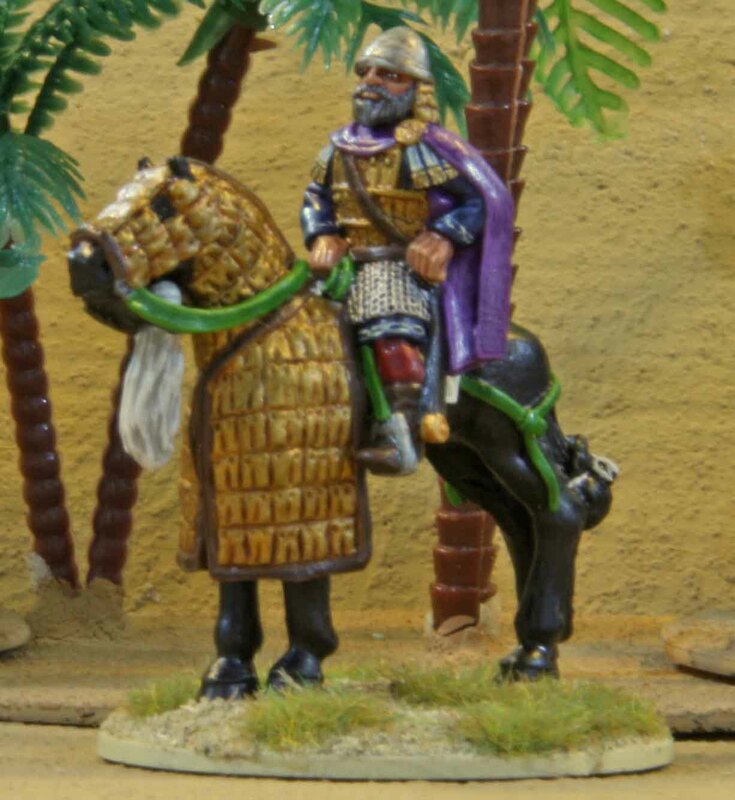 The next highest units are the Kavallaroi or mounted Heathguards. I chose two four men units each of archers and regulars cavalry. While historically these are equipped by the state as well, the were also the most prestigious units in the army. So I wanted them to look like lesser nobles and gave each of them a different tunic with intricate patterns. Now those of you who know SAGA will realise that these and a Warlord add-up to seven points and are too much to field a regular warband. The plan is that I will use all cavalry and only one unit of foot archers if I want an offensive set-up. By contrast I will remove one unit of mounted archers if I want a defensive set-up. Once the second foot spear is finished, I could also remove a unit of mounted close combat as well, but first I want to see how this one plays out. All of the above troops were done using the Army Painter Dip and touched up and detailed once it was dry. The shields are transfers from LBMS and applied after the army painted as well. Last but not least to lead the Warband is the Warlord or Basileus in this case (although I will not use the special rules fo him, since I feel this option actually weakens a Byzantine warband in SAGA). I gave him fine clothing with a purple cape, agin to show the Roman origins of the Byzantines. He was painted the classic way with normal highlights and all to set him apart from the rest of the Warband. What else is there to say. They were all based in a dryer scheme to represent their south-eastern European and North Arabian setting. The Warlord and foot troops were based on the standard SAGA bases, but I could not stand the square ones for the cavalry, so those are oval bases from Warbases in Scotland (a company I can not recommend too much). The minis themselves are all from Gripping Beast. Following up on my post showing the first three points worth of SAGA Vikings… here are another three bringing the Warband to a full 6 points. Now these were a bit of a rush job. I did not expect to be playing another game of SAGA for another two weeks, so these guys were not on the first spot in the painting queue. When Martin contacted me late last week to ask if I was free to play today, that suddenly changed. Saturday morning only the metal minis (Warlord, casualty and the four Jomsvikings) had been cleaned and primed. The Bondi were still on their sprues (plastic minis) and needed cleaning, assembly, filling and priming before I could even begin to paint them together with the others. But come Sunday evening, they were all done. Again… all the shields on these are freehand! 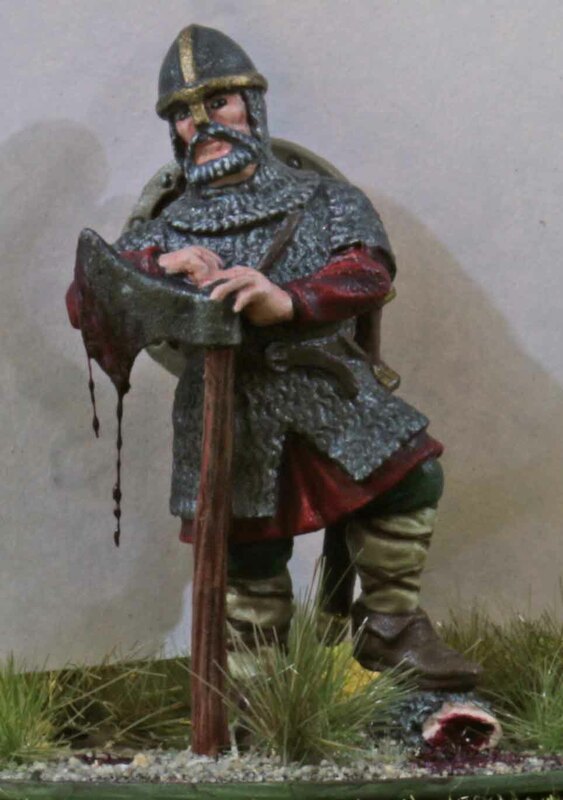 This is the Warlord for my warband, about to make a poor British peasant warrior pay with his life for even daring to oppose the Viking “shopping spree”. His name is actually a pun on my middle name. 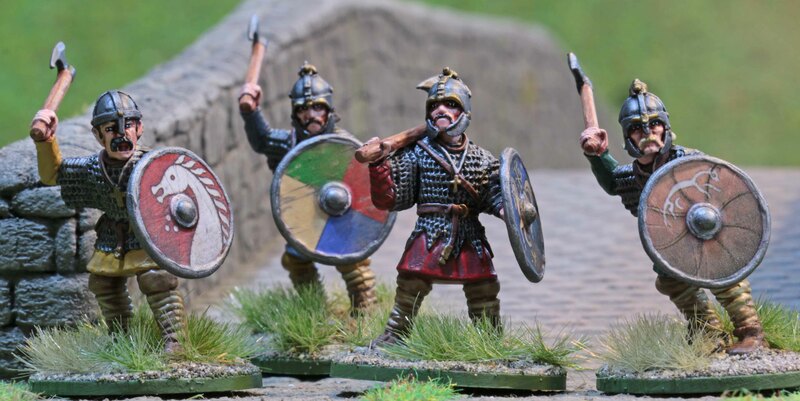 These are Jarl Sigvaldi (second from the right) and his Jomsvikings. 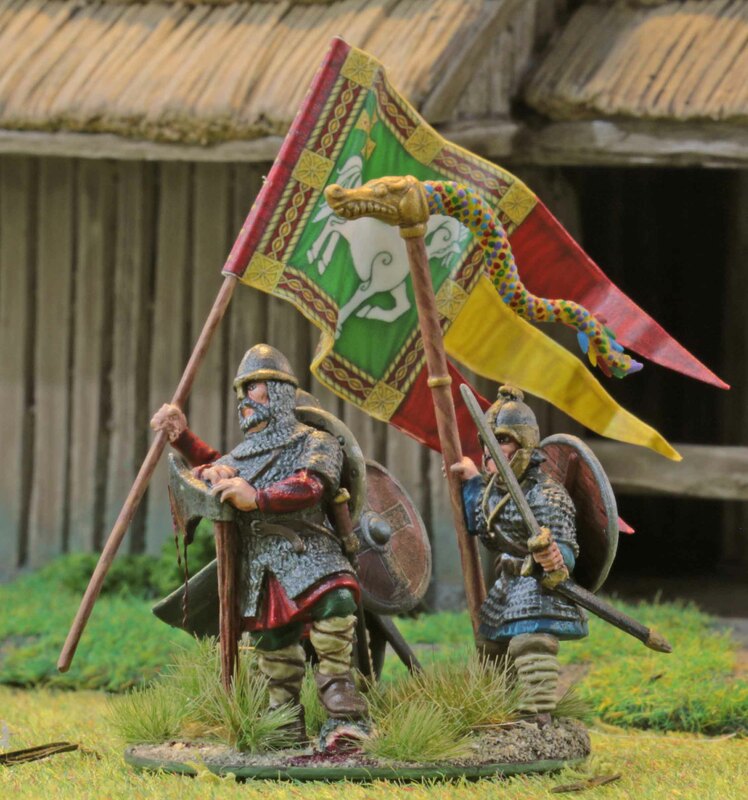 They are not “real” Vikings under the SAGA rules but Mercenaries classed as Heathguard and cost two points.The photo is a bit poor since Sigvaldi is facing in a way that you can hardly make out the details on his tunics and the guy on the left is hidden by his shield. But I hope there will be plenty of better pictures from the upcoming games! These are sized to fit into credit card sized laminating sleeves once cut up. These eight minis form a unit of Bondi (Warriors) and presented me with a bit of a problem. Since they come from the same plastic set that I used for my Hirdmen and Berserkers, their looks are not really that different to set them apart. In the end I armed them only with spears, gave their clothes plainer colours and painted simpler shield designs.Hope this works! And this is it… six points of Vikings finished for SAGA. Lets see how they do tonight!